Mamoru is Tuxedo Mask! Sailor Moon hold his mask in her hands, in complete shock over this revelation. Mamoru slowly takes the mask from her and places it back on his face. Sailor Moon panics and apologises and tells him that it's different now (that he's engaged to Hina). Tuxedo Mask begins to tell her, "I... also..." but stops himself and leaves. Sailor Moon is happy as she's sure now, that Tuxedo Mask loves her as much as she loves him. In the Dark Kingdom, Kunzite has confronted Zoicite over his attempt to save Mamoru. Kunzite yells about how their "master" betrayed them in the past and that it was his fault the world was destroyed. Zoicite doesn't believe this and suggests that Mamoru awakening will be okay as long as the princess is not involved. Kunzite tells him not to interfere again. Just outside, Nephrite is still sulking over his numerous defeats and embarrassments. Being angered by a Sailor Soldier taking pity on him (Dark Sailor Mercury) he stands up and readies himself for his next plan. Jadeite meanwhile is reporting to Queen Beryl. He tells her how Kunzite believes Sailor Venus to be a "fake" princess and that the real one has yet to reveal herself. Beryl says that this makes sense and tells Jadeite to keep up the good work. In Tokyo, Artemis and Minako are discussing their plans. Artemis is happy that the Sailor Soldiers have begun to awaken and Minako feels that something big will happen very soon. Just then, an assistant enters and asks Minako who she's talking to. She tells them that there's noone else in the room as Artemis lies on his side pretending to be a stuffed toy. At Mamoru's apartment, Hina is trying to open one of Mamoru's suitcases (unpacking maybe) and finds that she needs a key to open it. She immediately begins rummaging through Mamoru's draws until she comes across a draw dedicated to presents from Usagi. She begins to suspect that Mamoru has feelings for someone else and calls Motoki to change Mamoru's farewell party to an engagement party. Motoki tells Mamoru about this which makes Mamoru come over to crown right away. Once there, Mamoru talks to Motoki who tells him that he shouldn't just marry Hina because she's his childhood friend and her father has been looking after him financially for his entire life. As luck would have it, Hina overhears the entire conversation and runs away. Motoki begins to hate himself just a little while Mamoru runs after her. Unfortunately, Kunzite and Jadeite have begun a plan to draw out the Sailor Soldiers by releasing a super powerful Youma in Tokyo which begins to absorb the energy from a large amount of people. Hina gets caught in this tragedy and has her energy drained. Mamoru, still looking for her, runs into Usagi. They both look at each other tragically but then Mamoru eyes a weakened Hina and runs to her. Hina, barely concious begs Mamoru to marry her even if he doesn't love her and do it instead for her father. Mamoru promises to marry her. Usagi, being present the whole time forces a smile and tells them to run. Mamoru mutters her name which Hina hears. Usagi runs off to fight the Youma and transforms into Sailor Moon. When Sailor Moon arrives at the building she finds Sailor Jupiter and Sailor Mars already fighting the Youma and Jadeite. Suddenly Kunzite steps out from the shadows and attacks Sailor Moon. They fight for a while with a lot of physical attacks but Kunzite gets the upper hand and moves in for the kill. Luckily Sailor Venus arrives and blocks his sword strike with her chain. Jadeite then gets the Youma to freeze the Sailor Scouts. Sailor Venus and Jupiter are frozen immediately but Sailor Mars holds the ice blast off for a while with her fire powers before succumbing to it. As if things couldn't get any worse, Ami arrives and transforms into Dark Sailor Mercury and attacks Sailor Moon. Kunzite stops her and says that he wants to fight Sailor Moon. He swings his sword to attack Sailor Moon but Tuxedo Mask arrives and leaps between Sailor Moon and the sword fatally wounding himself in the process. Tuxedo Mask's mask falls off and splits in two. Mamoru tells Sailor Moon that he's sorry he couldn't return her feelings. Sailor Moon begs for him to stay with her but his strength fails and Tuxedo Mask passes away. Suddenly an image of the Moon Princess flashes over Sailor Moon and a bright light erupts from the scene. The Youma is destroyed instantly and Sailor Venus, Jupiter and Mars are freed from the ice. As the light subsides, Sailor Moon is revealed to be the Moon Princess! The crescent moon symbol on Sailor Venus' forehead glows and is replaced by a Sailor Soldier tiara. 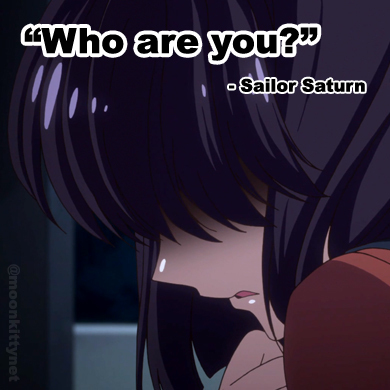 Sailor Mars begins to ask her what happened but Sailor Venus announces that Sailor Moon has awakened and tells them to remember their past. The Moon Princess continues to cry and out of her tears appear the Imperium Silver Crystal! The light glows and restores all the peoples' energy. 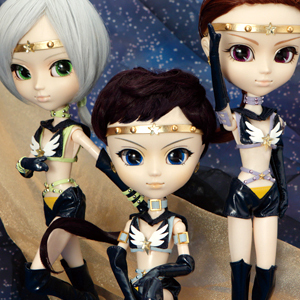 Kunzite, Jadeite and Dark Sailor Mercury teleport away. Tuxedo Mask begins to recover and looks up at the Moon Princess' tearful face and recognises her as being the same woman from his dream. Sailor Venus kneels and calls her Princess Serenity. Sailor Jupiter and Mars also kneel. Artemis looks on contently while Luna begins to remember her past. Princess Serenity stands up, shocked over her true identity. While Princess Serenity has appeared in several episodes as an out of focus image in Tuxedo Mask's dreams, this is the first time we get a clear shot of her in flashback and present. The Imperium Silver Crystal also makes it's first appearance.